The Buttstock Cheek Piece from Voodoo Tactical enhances the stability and comfort of a cheek weld, promoting a proper shooting position and more accurate fire. 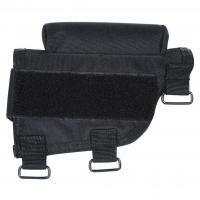 Three adjustable hook-and-loop straps provide a secure, movement-free fit on most stocks. The accessory can be attached to either side of the stock, making it equally suitable for left and right-handed shooters. The optional center pad can be used to lower eye relief for use with sights. A removable, covered seven-round ammunition carrier, compatible with .308 and .300 Winchester Magnum ammunition, is included. Like the cheek piece, the ammunition carrier is fully ambidextrous and secures to the stock through its hook-and-loop backing. Just the right height for the Mossberg 500 with a reflex red dot. Will purchase another for the rifles. Cheek piece works perfect, I just wish it was more adjustable because its actually too high, but I found my way around that. The actual product is very well built, good materials and nicely finished. It also comes with an ammo holder wich makes it more useful and looks nice with it. All I can suggest the makers is to add a lower height riser pad to the package or give us an option as an extra purchase, wich would make it more adjustable. The padded insert was a little too hard for me. Swapped it out with something a little softer. But that's my issue not the product itself per se. The product is solid and well made. Love all three of them.